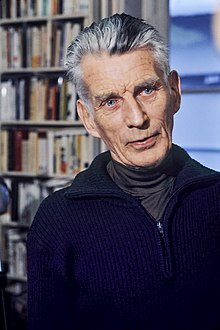 Ο Σάμιουελ Μπέκετ (αγγλ.Samuel Barclay Beckett) (13 Απριλίου 1906 – 22 Δεκεμβρίου 1989) ήταν Ιρλανδός λογοτέχνης, ποιητής και θεατρικός συγγραφέας. Το 1969, τιμήθηκε με το Βραβείο Νόμπελ Λογοτεχνίας. God is a witness that cannot be sworn. Memories are killing. So you must not think of certain things, of those that are dear to you, or rather you must think of them, for if you don’t there is the danger of finding them, in your mind, little by little. I don’t know why I told this story. I could just as well have told another. Perhaps some other time I’ll be able to tell another. Living souls, you will see how alike they are. How tell what remains ? But it’s the end. Or have I been dreaming, am I dreaming? No no, none of that, for dream is nothing, a joke, and significant what is worse. Have you not done tormenting me with your accursed time! It's abominable! When! When! One day, is that not enough for you, one day he went dumb, one day I went blind, one day we'll go deaf, one day we were born, one day we shall die, the same day, the same second, is that not enough for you? They give birth astride of a grave, the light gleams an instant, then it's night once more. Don't wait to be hunted to hide, that's always been my motto. Nothing is more real than nothing. [...] in the silence you don't know, you must go on, I can't go on, I'll go on. Yes, in my life, since we must call it so, there were three things, the inability to speak, the inability to be silent, and solitude, that’s what I’ve had to make the best of. Yes, yes, it's the most comical thing in the world. And we laugh, we laugh, with a will, in the beginning. But it's always the same thing. Yes, it's like the funny story we have heard too often, we still find it funny, but we don't laugh any more. Η σελίδα αυτή τροποποιήθηκε τελευταία φορά στις 3 Μαρτίου 2018, στις 11:25.